“I can’t even get my member to return my call.” I’ve heard it a million times. 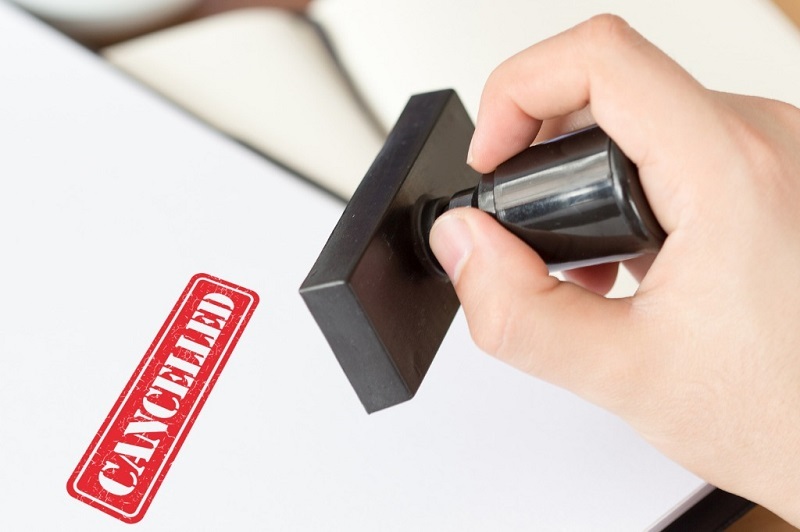 This person has been a member for months, but now they’re getting canceled because their monthly charge didn’t go through. The team emails, calls, and even sends a letter … no response. In the beginning, there were just a few of these, but now, you can see there is a disease. Members won’t return your emails and calls. This problem started in the hours and days after this member joined. You just don’t excite them anymore. Have you ever gotten excited about buying something, then a few weeks after you bought it you didn’t even remember you had it? And if the company who sold it to you calls you, are you going to take that call? Heck no! Even if you liked them well enough, it wouldn’t matter. No one likes talking to a person who doesn’t get them excited anymore. If you can’t get your member to return your call, you don’t interest them right now. You could maybe win back their heart in the future, but it’s not happening today. 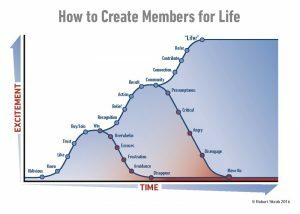 Here’s the member excitement slope you deal with most often. When your member first discovered you, she engaged with your materials, got to know you, built a sense of trust, and then finally bought from you. Her excitement grew every step of the way. Your marketing message talked to her pain, suggested a new approach, and promised a solution. She loved it, took out her credit card, and bought it. Then came your product. You gave her instructions and perhaps even an upsell. Maybe you even gave her access to a library of more stuff she could look at. Argh! Overwhelming. Time goes by, and she begins to feel badly that she can’t get around to it all. For some reason, she feels like if she can’t use everything you deliver, she has wasted her investment. Sort of like buying too many groceries and having some of them spoil in the refrigerator before you could eat them. And because she’s a member of your monthly program, you remind her about this frustration by sending her more each week or month. The backlog becomes bigger, and instead of being exciting, your program becomes another problem that creates pain. Rather than admit it’s her fault, she makes excuses. Your program is the wrong fit. It doesn’t work. Her frustration grows, so she begins to avoid you. Even if she doesn’t unsubscribe, she tells her email system to put your messages into her spam folder to be ignored. And soon, you are forgotten. As an alternative to all this, focus on growing your member’s excitement after her initial purchase by giving her an opportunity to feel good about herself. Give her an easy win. An easy win could be implementing a plan that provides clarity, achieving a certain goal, or attending an upcoming event that your member can look forward to — or all three. This win makes her feel good about herself. Invite her to tell you when she’s completed this so you can congratulate her. This feedback grows her belief in herself and in you so she’s ready to tackle something else. Soon enough, she’s taking action and achieving a transformation in her life. 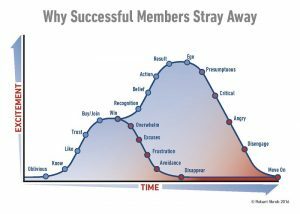 The inflection point between a member who quits and one who engages and gets a result is composed of two things. First, a small task that gives the member a quick victory. Second, a way for her to report that quick win so you can give her recognition — a good job. When your kindergartner arrives home from school with an art project, you put it on the refrigerator. You show your pride in this achievement, and this gives your child belief in himself. Recognizing your member gives her belief in herself. Often, this can be automated through website tracking, online badges, and automated follow-up emails, although it’s just as effective if your people do it manually. What is a quick win you can put in place for your new members? How will it make them believe in themselves? How can you increase the member’s status among her friends. Finally, what kind of feedback mechanism will you need to put together so that you can be alerted to this win and give your new member recognition? The answers to these questions will help you stop your members from quitting. But this isn’t the end of the story. While this helps stop your new members from quitting, you start to notice members are quitting after 6–12 months. It feels like the ultimate rejection. What!?! Your membership helped them grow, but now they feel they are too good for it? 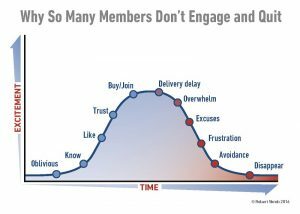 Yes, that’s exactly how they feel, and it means your Member On Ramp is working but your monthly deliverables don’t. I learned the cure in the nonprofit association world, where I started my career. 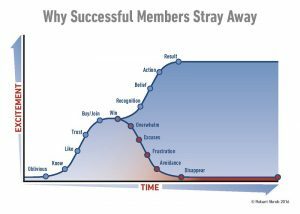 Associations retain their members for decades, even though their benefits aren’t 25 percent as good as what you deliver. So why do associations keep their members for decades with inferior benefits? Here’s the chart that illustrates the cure. There are several components, but it comes down to the difference between Business Week and People magazine. Business Week has great information, excellent content. Yet People has four times the paid subscribers. People want to read about people. Your media must feature members. Even if you are delivering stuff, the growing subscription boxes, subscriptions that are otherwise based on getting stuff, include inserts that feature their members. Your members will love stories, member breakthroughs, and case studies illustrating how other members overcome their biggest problems by implementing what you teach. This will be inspiring and make someone’s individual victory feel like their own personal success. Experts from outside the community are only 10 percent as interesting as member-created content or stories featuring members of the tribe. Many clients don’t get this when I explain it. It’s counter-intuitive. But when you think about it, this is exactly what Dave Ramsey does with his radio show. While he has one or two experts from time to time, 80 percent of his “content” features people who are celebrating getting out of debt or are somewhere on that journey. There’s never any new insight or tactic discussed. It’s all about people overcoming problems and applying the principals of the tribe. There is no church today trying to get more people to show up this Sunday by promoting that they are going to reveal “The 11th Commandment.” There’s never anything new revealed at church. Instead, it’s new examples that help you understand timeless principals in an enlightening way. When you implement this, content creation becomes a lot cheaper and easier. And members stay for decades. Most association conferences feature members presenting sessions. There’s maybe one or two outside keynote speakers. For some reason, entrepreneurs think they are “improving” the conference by featuring lots of outside speakers. But these conferences rarely grow past a certain point. People want to read about people. Your members want to hear member success stories that illustrate the values you teach.